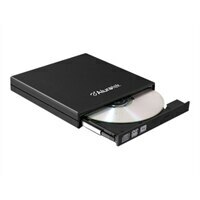 Aluratek's AEOD100F external DVD-RW will allow you to load all of your CD-ROM/DVD-ROM software to your Netbook or Nettop computer that does not have a CD-ROM/DVD optical drive. Simply plug the included USB cable into your computers USB port and you are all set. There are no drivers to load or software to configure making it truly plug-n-play and no external power is required. Once connected to your computers USB port you may also write/burn or create a CD or DVD effortlessly with the included "Nero" digital video editing software at blazing fast speeds.